This entry was posted on Monday, August 22nd, 2011 at 9:33 am and is filed under Weather. You can follow any responses to this entry through the RSS 2.0 feed. Both comments and pings are currently closed. EML: 50-100J/kg PDX/VUO metro/Willamette Valley, 0-25J/kg CIN Cascades. Things are going according to plan based upon last night’s analysis. Bend is about to get rocked. 1.48″ hail marker, 100% severe hail.. Severe warning may be needed soon. 2.02″ hail core marker, 100% severe hail. Severe Thunderstorm Warning needed now. Big storm west-southwest of La Pine is close to severe…. 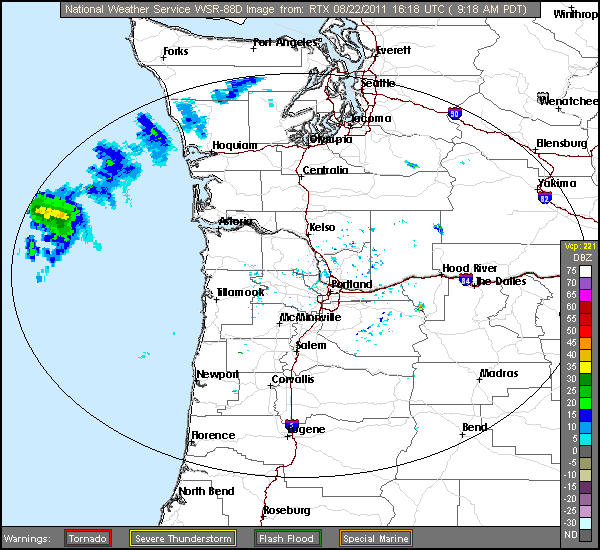 New cells firing south of Eugene…. 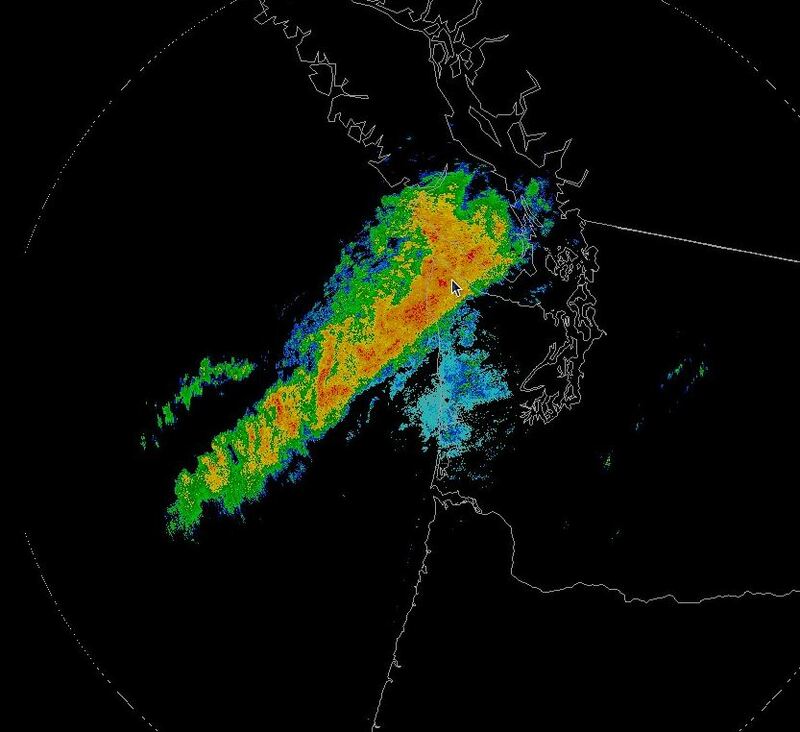 Hey Rob do you think these cells trying to fire up near Eugene, and the lightning offshore means we may actually be able to pull of some lighnting here? The thunderstorm ended near Terrebonne in central Oregon sprinkling enough drain to wet the deck. Lightning now occuring near the north Sisters mountain. Mr DELXV, you must have used a new IP or Email address…that’s why your comment was held up. Should be good to go now. Overnight storms still look very possible. I see no reason to chance any previous thinking and the NWS agrees with this. can someone send link to Marks lightning page please 🙂 thanks! I am seeing one thing unfortunately though that well, doesn’t bode extremely well for storms, especially anything severe drifting off the Cascades. WV Loop shows that the flow is having a difficult time backing to the SSE with mainly a southerly flow. Radar trends confirm this with storms moving N-NNE along the Cascades. As the ULL nears the flow should back to at least southerly due to the circulation around it, and there’s a chance even southeasterly, but yeah until it does so its hard to be overly confident. However as the ULL and increasing lift approaches we could see storms fire virtually anywhere thanks to the strong shear and elevated instability in place.